In July of 2014, employees at the Centers for Disease Control and Prevention discovered, in a cold storage facility unused for decades, several vials that contained living strains of the smallpox virus. When confronted with the proximity of a contagion assumed to be remote in both place and time, most Americans understandably responded with outrage and thinly veiled terror. 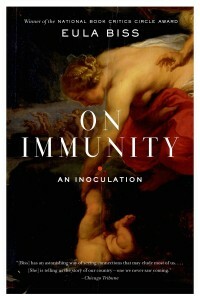 Normally I do not get caught up in the fervor that these kinds of stories create—casual dismissal of serious large-scale threats is perhaps endemic to my generation—but I was at the time reading Eula Biss’s new account of vaccines and disease, On Immunity: An Inoculation. Suddenly, every news program and internet forum was an active theater in the very same war that I was reading a detailed history of. The situation was fluid, and no one truly knew the extent of the threat that had been lurking, right under our noses, inside a random storage closet in Bethesda. But one thing that the 24-hour news cycle made clear to me was the same general sentiment at the heart of Biss’s book: our fear of these microscopic viruses, and of the epic scale on which they can potentially disrupt our society, is perhaps the rawest and purest fear a person can experience. If we understand ourselves as living in a world of unseen evils, the immune system, that largely conceptual entity devoted to protecting us from invisible threats, will inevitably take on an inflated importance and a distorted function. As long as a child takes only breast milk, I discovered, one can enjoy the illusion of a closed system, a body that is not yet in dialogue with the impurities of farm and factory. Caught up in the romance of the untainted body, I remember feeling agony when my son drank water for the first time. “Unclean! Unclean!” my mind screamed. The intensity of this base fear is so strong that even the life-giving miracle of water becomes suspect, tainted, potentially devious. The foundation of life itself is not to be wholly trusted. This is, of course, an unsustainable attitude; a moment of weakness. There is no protection from interacting with the outside world, and no chance to remain indefinitely in a sealed bubble. One of the great strengths of Biss’s work is how she embraces this theme of community and champions the role of a collective social body in the fight against disease. This is the counterbalance to all her fretful anxiety, the note of hope and harmony that rings out over the chatter of fear. “The boundaries between our bodies begin to dissolve here,” she writes. “Donations of blood and organs move between us, exiting one body and entering another, and so too with immunity, which is a common trust as much as it is a private account.” This is in reference to what she calls herd immunity, the idea that mass vaccinations are essential to controlling a virus’s ability to move between hosts, and thus the most pragmatic means we have of eliminating contagious diseases. Cory Johnston is the Books Editor for The Literary Review.